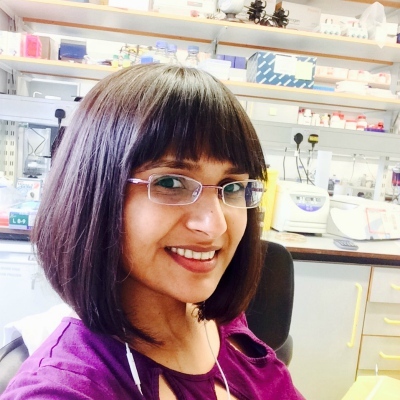 I obtained my BSc (Hons) in Microbiology in Dhaka, Bangladesh, and then moved to London in 2008 to start an MSc in Molecular Pathology and Genomics at Barts Cancer Institute (Barts and the London School of Medicine and Dentistry). Graduating with distinction marks, I was able to obtain two CRUK grants to continue with my research for the next two years at the same institute, working in the Departments of Tumour Biology and Experimental Cancer Medicine, respectively. I then became the first Bangladeshi woman to receive a Gates Cambridge Scholarship, and began a PhD in Pathology at the Hutchison-MRC Research Centre, where the next four years of my work focused on cancer genomics. I submitted my thesis late in 2016 and graduated this summer; I have been working as a postdoctoral research associate in the Alzheimer’s Research UK Drug Discovery Institute (Cambridge Institute for Medical Research) since early 2017.